A nice article in the Daily News this morning discussing the on-going contract talks with Tra Thomas. A deal that I thought was already sealed and delivered appears to be stalling out. Seems to me that the Eagles are low balling Thomas. What, the Eagles and Banner being cheap...never! So following the McNabb comments the Eagles continue to follow their old game plan. Build a team, hoard the salary cap money. Letting Thomas hit the FA market seems idiotic to this fan. Quality offensive tackles are hard to come by. Thomas is coming off a quality season and based on his workout regime appears to have 1-2 good years left in his 30+ year old body. So come on Banner, open up the pocket book and pay the man. The Eagles can't expect to be successful in 2009 with two new offensive tackles. 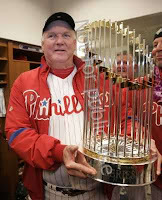 Banner needs to take a walk across the street to Citizens Bank Park and see what happens when a team spends money. That shiny trophy is called a championship! Eagles runs to the left side averaged worse than they have in years. He got manhandled in the Championship game, and he also blew a blitz pickup to the outside (Herremans saw it and shifted to Tra's man, Tra never moved to the outside). He's declining very fast. so would you be comfortable with Herremans at LT and then sliding Maxie to LG? Yes on Herremans, though best case is Andrews at LT (athleticism). The coaches may know if H can handle RT, I don't. Draft OT in Round 1 and let them fight it out since there are no healthy, proven FA OT's left. MJG looks too fat to play anything except RG, maybe he'll step it up. They should go hard after G/C Jason Brown, that would solidify either LG or C.